I was thoroughly impressed with the work that was done, as well as with the outstanding customer service. You depend on your car to take you where you need to go, and our goal is to make sure your car is there for you. We pride ourselves on having the best customer service of any Marysville Dodge service and repair dealer, whether you need routine maintenance or a serious fix. Our Marysville auto repair shop has served the Marysville and Everett communities and the rest of Snohomish County for over 30 years. All of the Services You Need - with a Smile! Our Marysville auto repair shop has an unbeatable combination. We love to work on cars, and we love customers! We do what it takes to keep your Dodge running reliably and safely for its entire life. Our mechanics are ASE-certified by the National Institute for Automotive Service Excellence, and we use the latest technology and tools to maintain and repair all makes and models of Dodges. Our prices are competitive. 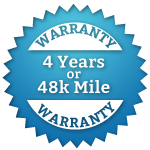 We are so confident in the quality of our work that we offer a 4-year/48,000-mile warranty for our Marysville Dodge services and repairs. Contact Bud's Auto Repair and Transmission to find out what we can do for your Marysville Dodge service and repair. We love our job of keeping Snohomish county residents safe and satisfied on the roads!